Filed to: can you collide a sandwich?Filed to: can you collide a sandwich? can you collide a sandwich? 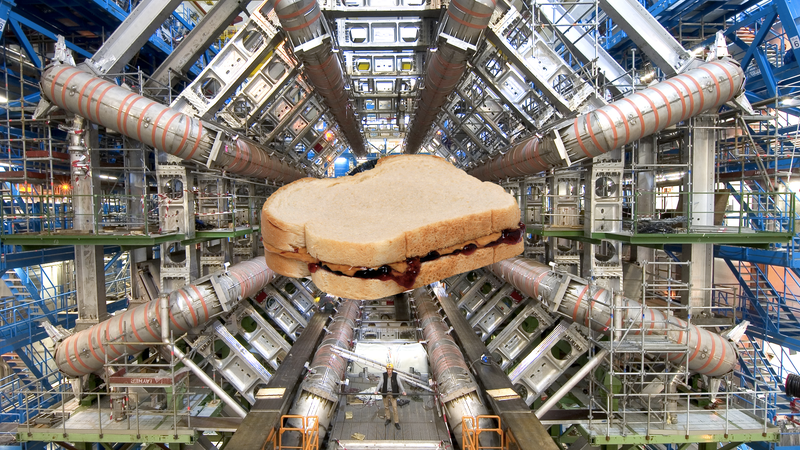 A sandwich edited onto an image of the LHC from 2008. You’d be surprised at how many times someone has asked whether the Large Hadron Collider (LHC) could collide mundane things, like a sandwich. The answer is, not quite... but almost! It’s sort of a long story, and the explanation might surprise you. In fact, physicsts recently put something unusual into the LHC in Geneva, Switzerland. For just a few hours this past October, scientists at the world’s largest, most expensive high-energy physics experiment swapped out the usual tiny proton and large lead sources and instead slammed together intermediate-sized xenon atoms. They hoped to learn more about a mysterious phase of matter that may have existed in the moments after the Big Bang. We typically think of the universe’s stuff as being made from atoms arranged as solids, liquids, or gases. But perhaps during the universe’s high-energy origins there was another phase, a liquid whose constituent parts were quarks, the smallest units that make up protons and neutrons. Scientists have seen some pretty telling evidence of this quark-gluon plasma by colliding heavier lead, gold, or copper atoms stripped of their electrons. They’ve similarly seen hints of it by colliding protons with lead, or even just protons, the positively charged pieces that make up atomic nuclei. The researchers want to understand how this quark-gluon plasma varies based on the size of the stuff they collided. Gold and lead atoms are relatively pretty big, while protons are very small. Xenon atoms are right in the middle—meaning this work can help fill in the holes. A nuclear collision between xenon atoms. “Our field has historically learned a lot from being able to change nuclear size,” Dennis Perepelitsa, physicist at the University of Colorado, Boulder, told Gizmodo. “For example when [the Relativistic Heavy Ion Collider at Brookhaven National Lab in New York] ran copper-copper instead of their usual gold-gold, it was revelatory and resulted in a major paradigm shift.” Changing the colliding nuclei can change the size, temperature, shape, and other properties of the resulting quark-gluon plasma. Understanding how to switch elements requires a knowledge of how the LHC works. The most famous experiment at the LHC is just the biggest ring in a series of smaller, turbocharging racetracks used to accelerate bunches of particles. This begins either with a bottle of hydrogen gas or a very pure lead pellet with only a single isotope of lead—atoms that all have the same number of neutral neutron particles. The bottle’s gas valve is opened or the lead pellet gets vaporized, then the particles head on their journey through straight lines and loops, are stripped of their electrons, and are sometimes diverted into other experiments along the way, before entering the 17-mile-round LHC ring. So, switching between lead and xenon requires replacing the lead pellet with xenon gas—an easier source to deal with, John Jowett, accelerator physicist at CERN, told Gizmodo. Then, they just need to configure and calibrate the machine and its magnets. As to whether you can collide a sandwich, it would need to be vaporized first, and its atoms probably wouldn’t make it very far through the series of racetracks. Scientists tune the experiments’ magnets to accelerate very specific combinations of atomic charge and mass, so any of the elements that don’t fit the criteria will be lost early on, said Jowett. And if an atom or two did make it into the main ring of the Large Hadron Collider, there probably wouldn’t be enough stuff to produce any collisions—the LHC beams collide lots of atoms or protons at the same time. “You have to get things right all the way through,” he said. Without being able to produce collisions for the giant detectors to spot, accelerating a sandwich wouldn’t be very interesting. Accelerating and colliding xenon atoms was very interesting, though. The few hours of data-collecting resulted in tons of experimental results, presented last week at the 2018 Quark Matter conference in Venice, Italy. The researchers noticed some small differences between what they measured and what they expected from the collisions, which may be important for understanding the nature of the quark-gluon plasma. So, no, you can’t collide a sandwich. But putting unusual things into the Large Hadron Collider can lead to some interesting scientific results.